Schöne Aussicht aus der 5. Etage! Das Gebäude "CASTLE BEACH" liegt direkt am Strand! Das große Studio befindet sich im Herzen von Miami Beach, 5445 Collins Ave, mit spektakulärem Meerblick! Alles was Sie brauchen, alles inklusive !!! Das Appartement befindet sich im CASTLE BEACH und ist ein idealer Ausgangspunkt, um Miami Beach zu erkunden. WLAN-Zugang (kostenlos), Küche (kostenlos), Fernseher, Gymnastikraum, Tennisplatz, Sauna. Direkter Zugang zum Bau von Plätzen. * coffre fort, 2 chaises de plage, sonnenschirm ..
Sécurité dans tous le building ist rund um die Uhr für Sie da. Apartment in CASTLE BEACH und Umgebung in Miami Beach, nur wenige Minuten zu Fuß vom Strand, WLAN-Internetzugang (kostenlos), WLAN-Internetzugang (kostenlos), TV, WLAN und WLAN-Internetzugang (kostenlos), Sauna. Direkter Zugriff auf das Edificio hasta la playa. The communication with Fabrice&Sabrina was perfect and very friendly! 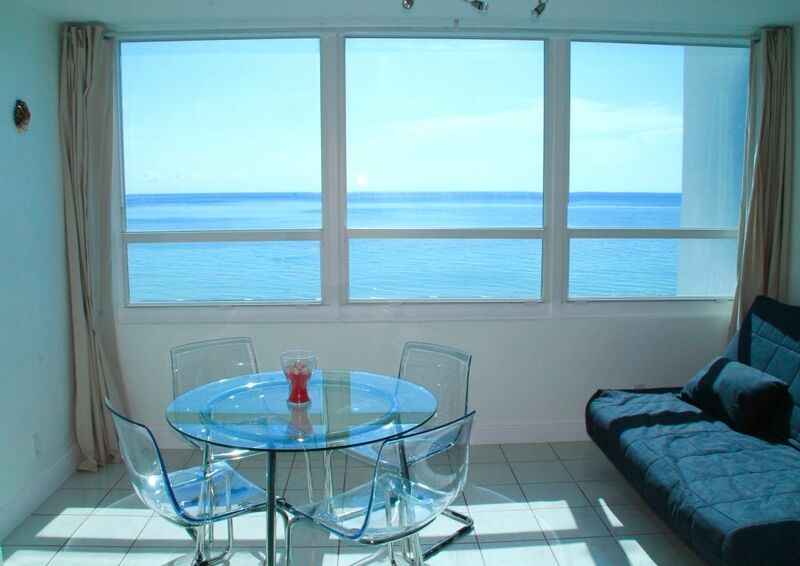 Amazing ocean view, very clean condo, easy & very fast check in, direct access to the beach, wonderful pool. The price for the apartement was absolutely ok!!! The busstation for the Miami Trolley Is close to the apartement. We recommend to everyone. Thank you so much Marc ! It was a pleasure hosting you ! thanks for staying ! Everything is exactly as expected. And the hosts are very caring. Thank you very much. Thank you so much ! It was a pleasure to hosting you ! We attended a wedding on South Beach and Sabrina's condo was perfect for our 4 day stay. The view is amazing...you feel like you are on a cruise ship. Also, it was immaculate and the beds were super comfortable as well as the sheets! Well stocked with everything you need.We loved swimming in the pool too! Communication was excellent! Highly recommend ! It was a pleasure to hosting you. Welcome back anytime ! The condo has all the comforts of home and unlike our last condo/hotel experience the staff have everything under control. The parking is free and the valet staff are great. Check in is easy, quick and we were soon in our condo looking out over the ocean. The condo is clean and stocked with everything that you need to enjoy your stay. Communication with Fabrice was flawless and with a very quick response time. The hotel is a little older, but they keep it clean and maintained. If you want perfection and a brand new hotel then go ahead and pay 4 times as much. This is a great condo and an amazing price for being right on the beach. The Russian/Turkish bath and spa in the hotel is amazing and highly recommended! We will be back and renting from Fabrice! Thank you so much for your stay !! Resort is dated. Needs some gardens around pool area. Lobby hasn't been updated since the 70's. Our room grungy but livable. Beds were comfy. Bring toilet paper as they only leave you 1 roll. We had a good time but I wont be going back. When you left you sent me this message so your review ??!!! « Hi, Yes, we had a great time. No problem. The room wasn’t grungy we use professional cleaning and we check the apartment before each arrival. Also we provide 2 rolls of toilet paper. We don’t provide paper for all stay it’s just a welcome set. We do provide daily cleaning on request if you don’t want to buy toilet paper. You have a park with grass just beside the building, I wish you would ask me during your stay. You can enjoy the new sidewalk on the beach for a walk. The building was updated last year, new hurricane windows, new elevators, beach chairs and more improvement was made. The update of the building does not depend on me. Love the place, owners are grand and easy to get along with. Views. Pool, ocean are gosh darn outstsnding. Thank you so much !! It was a pleasure ! !